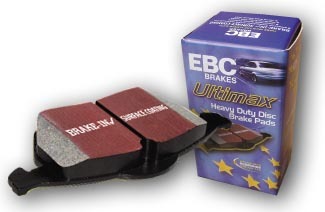 EBC black coded brake pads are a high friction premium quality friction material approved to ECE R90 brake safety regulations and as such are an exact equivalent to original equipment pads fitted to your vehicle from the factory. When you buy EBC R90 replacement pads you are getting an exact equivalent to an original equipment pad for far less money. Don’t let the lower price point cloud your view of this superb quality product, these pads will stop your vehicle as fast as any original equipment pad and faster than most aftermarket pads. One brilliant feature of EBC R90 pads is their ability to completely eliminate brake judder and these pads will actually COMPENSATE for mild brake judder after 300-400 miles of use. Nominal friction co-efficient 0.46 with minimal rotor damage and similar dust to original parts.